Glendale Heights and Bloomingdale drivers looking for a spacious and dependable midsize crossover or traditional full-size SUV may be choosing between the 2016 Chevrolet Traverse and the 2016 Chevrolet Tahoe. Both vehicles offer a powerful performance and room for up to eight passengers. However, before you make your decision it’s important to realize that there are some important differences to consider. Learn more about each vehicle below to determine which one is the right choice for your specific driving needs. Whether you want to haul lots of people or cargo, both of these vehicles offer you a lot of available space. The 2016 Chevrolet Traverse offers Smart Slide technology on the second row seats so that passengers can easily get to the third row. This vehicle also offers seating for up to eight passengers, and the LTZ model offers tri-zone climate control and heated and cooled seats. If it’s cargo space you crave, the Traverse offers up to 116.3 cubic feet of it when you used the second and third rows of seating for storage. Behind the third row, there’s 24.4 cubic feet of cargo space available. The 2016 Chevrolet Tahoe also offers impressive cargo and passenger space. This vehicle also allows seating for up to eight passengers. This SUV offers power-release second row seating so passengers can get to the back row with ease. Plus, the third row seats fold flat to increase cargo space. The Tahoe offers up to 94.7 cubic feet of cargo space when needed. Both the Chevy Tahoe and the Chevy Traverse offer some impressive technology to ensure drivers and passengers are always connected while on the road. The Traverse offers three USB ports so that front and backseat passenger can keep their devices charged at all time. There’s also an available backseat entertainment system so that backseat passengers can remain entertained throughout the drive. 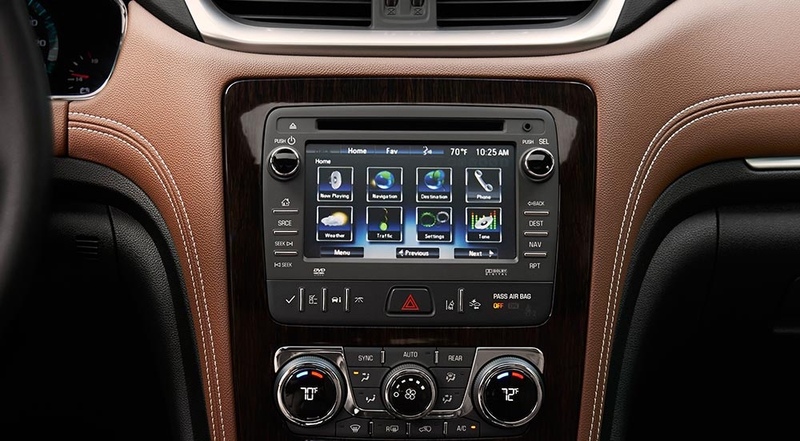 Plus, this vehicle offers built-in 4G LTE Wi-Fi, Bluetooth technology, SiriusXM Satellite Radio, and an impressive Chevy MyLInk touchscreen interface. 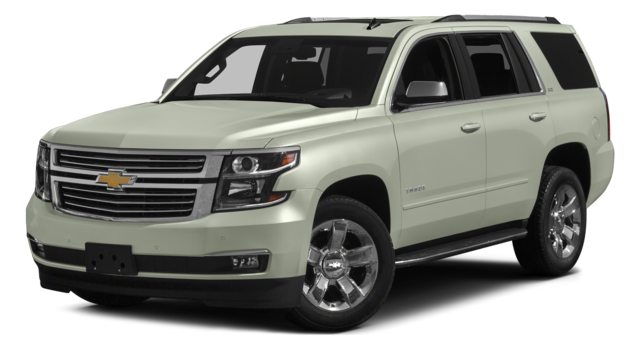 The 2016 Chevrolet Tahoe is also impressive when it comes to the available technology in the vehicle. The eight-inch driver information system helps ensure that drivers remain connected to all necessary information without taking their eyes off the road. This vehicle also offers 13 different charging stations, a 110-volt outlet, a push button start system, and advanced Chevrolet MyLink technology. Plus, like the Traverse, it also has built-in 4G LTE Wi-Fi. No matter which vehicle you choose, you’ll enjoy peace of mind knowing you’re safe. 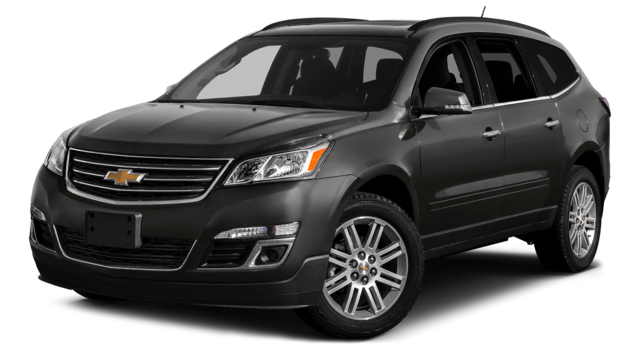 The Traverse offers many different safety features, including Side Blind Zone Alert, Lane Departure Warning, Front Center Air Bag, and more. The Tahoe offers seven standard airbags as well as safety technology features, including Lane Keep Assist and Front Park Assist. This full-size SUV also comes with OnStar Automatic Crash Response System, which will immediately connect you to first responders in the event of a collision. Both the 2016 Chevrolet Traverse and 2016 Chevrolet Tahoe are great options. If you’re looking for a spacious vehicle that can handle all of your cargo needs, the Traverse is the better option, as it offers more available cargo space. If you want a vehicle that can give you the power you demand, then the Tahoe is the better option. This vehicle has a more impressive engine and can tow almost 3,000 pounds more than the Traverse. If you are interested in taking an adventure, then this is the vehicle to choose. No matter which vehicle you decide to buy, Sunrise Chevrolet has both vehicles in stock ready for you to test drive and take home today. Let our sales team help you determine which one is the better option for your specific needs in Glendale Heights and Bloomingdale. Contact us today to learn more about each vehicle or to schedule a test drive, and then make your way to our dealership at 414 E. North Avenue in Glendale Heights, IL.